The Dolphin Swim Adventure in Isla Mujeres is an unforgettable experience. You’ll enjoy all the beauty of Cancun while getting up close and personal with some of nature’s most majestic and intelligent creatures — dolphins. You will snorkel, swim, and play with these friendly creatures in the warm, blue waters. Get ready for the experience of a lifetime when you have a Dolphin Swim Adventure in Isla Mujeres at the beautiful Garrafon Natural Reef Park. You couldn’t ask for a more perfect setting to create memories that will last a lifetime. The scenic views, sand, surf, and sun create the perfect backdrop for this one of a kind tour. The tour begins with a 15-minute briefing on how the interactions will work. Once you’re in the water, snorkeling will give you incomparable access to the unique, thriving underwater world. Observe dolphins in their natural habitat as they majestically swim and interact beneath the water’s surface. Your swim with the dolphins would not be complete without some one-on-one time, and you will have plenty of that. Group sizes are kept small, never more than 12 people, to ensure everyone gets ample time with these amazing creatures. The program features a wide variety of dolphin interactions for you to enjoy. Your encounter will include interactions like a kiss, a hug, and a handshake from the dolphin. You’ll also enjoy exciting behaviors like a belly ride that lets you move through the water almost as one with the dolphin. The boogie push, also included in the program, involves a dolphin pushing you through the water swiftly while riding a boogie board. You’ll have a fantastic and memorable time interacting with these intelligent and friendly animals. 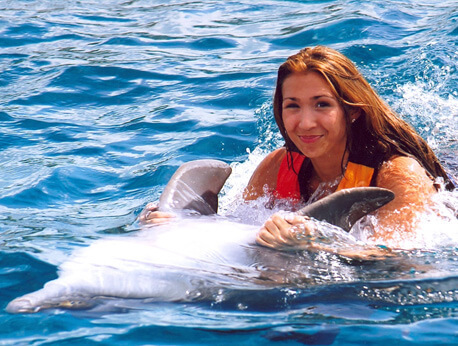 The amazing trainers will be as friendly and warm with you as they are with their dolphins. The dolphins are well cared for and happy, making them ideal companions for all ages. The tour is suitable for all ages, but there are some safety considerations. Please keep in mind that any children under the age of 10 will require a paid adult to swim with. Additionally, infants must have two paid adults for safety. Woman more than five months pregnant are unable to participate in any of the aquatic programs. To get everything you want out of your experience, please remember to arrive at least 30 minutes before your program. This will give you time to attend the required briefing before starting your excursion. Be sure to use a biodegradable sunscreen to protect yourself and the marine life. Cash (Mexican pesos) and towels are also necessities. We also suggest allotting yourself plenty of time to enjoy the gorgeous Garrafon park and all it has to offer.